The house of Chaumet was founded in 1780 by Marie-Etiene Nitot as Nitot et fils. 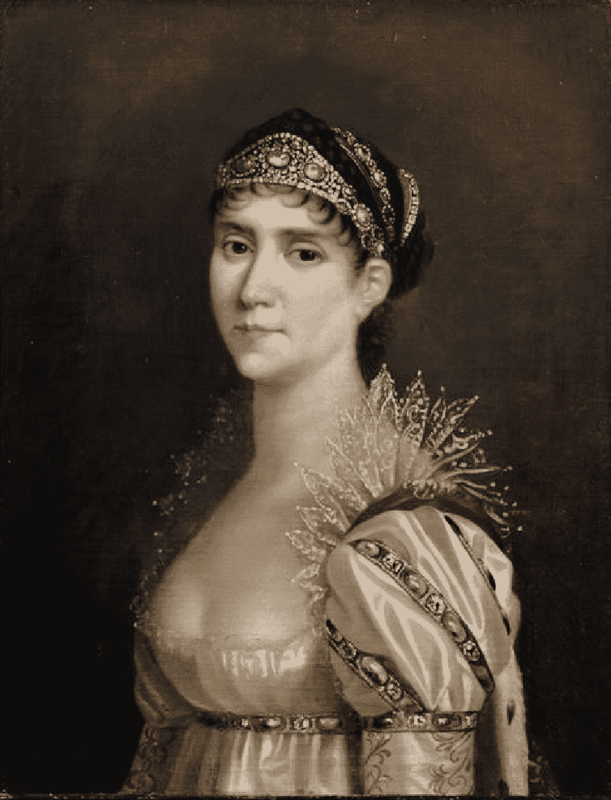 Nitot had begun his career working with Auber, jeweler to Queen Marie-Antoinette. An aristocratic clientele was soon to follow him to his new workshop. 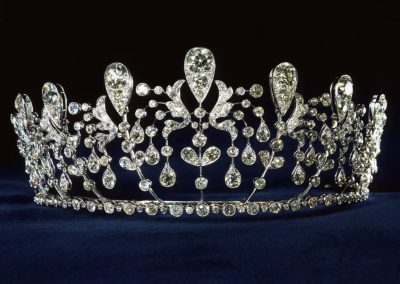 A reputation as the “jeweler of the tiara” was earned in those early commissions when Nitot created the coronation crown for Napoleon. Napoleon wanted to make his family transcendent and saw jewels as the true symbol of power to be used in displaying his kingly authority. Empress Josephine appeared at the coronation resplendent in a tiara created for her by Nitot, and so it began. The trend spread like wildfire through the court. Nitot went on to create Empress Marie-Louis’s wedding parure, a tiara for Pope Pius VII and many more incredible creations. Naturalistic tiaras and headbands made of garlands of flowers, fruit, leaves, feathers, and bows, graced the heads of European aristocracy and those who wanted to look like aristocracy. In 1815, Jean Baptiste Fossin, the workshop director, took over from Nitot’s son Francois Regnault. During this time romantic jewels were the style of the day. Naturalistic vines, leaves, olive trees, hawthorn flowers and fruit rendered in emeralds, rubies, diamonds and topaz were the overriding designs being produced. Fossin’s successor, Jean-Valentin Morel, went to England after the revolution and through his London branch, became jeweler to Queen Victoria. Eventually, his son Prosper Morel followed in his footsteps. Clients included Emperor Napoleon III, Eugenie of Montijo, and many more members of the French aristocracy. Paris was once again glittering with jewels and luxury. The Bourbon Parme Tiara c.1915 is Emblematic of the House of Chaumet. Joseph Chaumet married the daughter of Prosper Morel and took over running the house in 1885. They created jewels for virtually every court in Europe, Russia, India and the near East as well as for the simply well-to-do. Social emblems, fashion accessories, tiaras, and aigrettes were the popular jewels of the day. Joseph was followed by Marcel Chaumet in 1928. Creating the more geometric fashions of the 20’s and the feminine jewels of the 30’s, Chaumet continued to thrive. Following World War II, the house continued their tradition of fashion-forward design. Chaumet’s long tradition of personalization and their ability to realize the client’s expectations of perfection has kept a loyal following through generations. More than 2,000 tiaras have been created by the house since that first iconic tiara created for Napoleon. Etienne Nitot Opens for business on rue St. Honoré. François Regnault Nitot takes over the firm after the death of Etienne Nitot. Napoleon commissions a ruby parure for his bride, Marie Louise. François retires and turns the firm over to Jean Baptiste Fossin, his workshop director. Fossin & Fils named “Crown Jewellers” of France. Jean Valentin worked for Fossin. Royal Warrant: Queen Victoria – to Morel. Morel’s daughter married Joseph Chaumet. Fossin turns the company over to Prosper Morel. Fossin organizes the bijouterie et joaillerie française for the London World Exhibition. Joseph Chaumet partners with Morel. Chaumet marries Morel’s daughter and takes over the firm in 1885. Gold Medal at the Paris World Exhibition. Became known as the Master of Tiaras. End of Chaumet family involvement in the firm.